Just as each person has a civil birthday, they also have a Jewish birthday and a Jewish name, both of which are steeped in history, and rich in significance. 1. 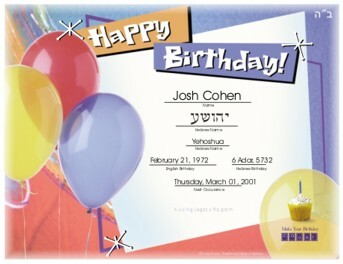 Your child will receive a certificate (see below) with his/her Jewish birth date. 2. Each year your child will receive a surprise birthday package indicating the upcoming Jewish birthday and a special birthday gift. One's Jewish birthday is, of course, the date upon which one was born according to the Jewish calendar. Far from considering it incidental, Jewish tradition regards one's Jewish birthday to be fraught with meaning and relevance and, in some ways, even a mini-Rosh Hashanah! The Talmud informs us that on our Jewish birthdays our mazel (good fortune) is dominant. 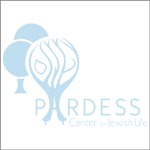 The Jewish birthday is the perfect day for reflection about our lives as Jews and is an auspicious time to make new resolutions to perform good deeds and to deepen our commitment to Torah and the role it plays in our lives. On one's Jewish birthday it is customary to get together with family and friends to celebrate Jewishly. At the celebration one should say a prayer of thanks to G‑d, give money to charity, and learn some Torah.